I haven’t quite got time to write a full Vintage Village blog tonight…. well, ok, I have, but if I do, Mr M will stop talking to me so I’m opting for spending at least some of my Sunday with him 🙂 But I just had to share this, especially given the entirely co-incidental tweet that Mrs Airy Fairy sent out earlier about still loving this man in Grease, which she was clearly watching on a lazy bake-free Sunday on some random Sky channel. 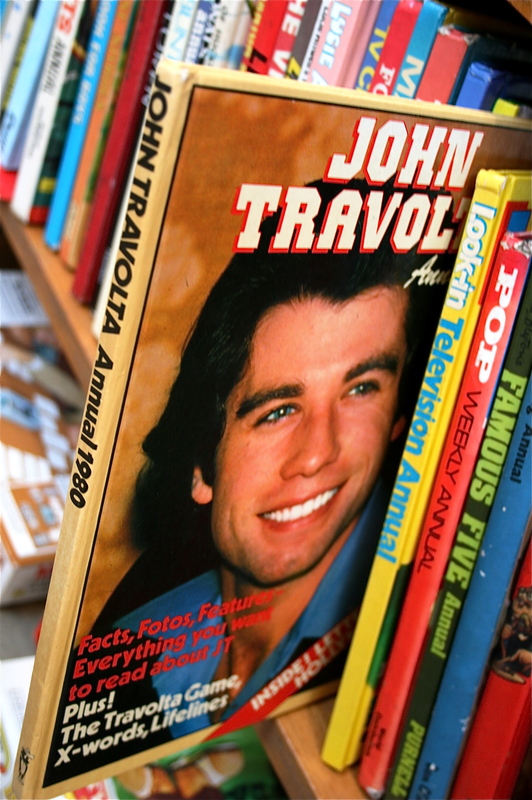 I spotted this on one of the stalls at Stockport Vintage Fair this afternoon, the John Travolta 1980 Annual, and was utterly delighted. I loved this man. Yes, yes, he was my rebound from Elvis who’d left me for the great Graceland in the sky in 1977, but it was a true love nonetheless. The minute I saw him up on that screen in November 1978 on Louise Earrey’s birthday trip to watch Grease at the cinema, with his black leather jacket and his dimpled chin, the minute he sang “It’s hy-y-y-dromatic’, the dye was set for my endless fascination with swarthy, chiselled jawed cheekiness. I will always love my granddad for arranging a 4ft high plastic poster of Danny Zucko’s face to be posted to me, a face which actually stuck out like a real one, with a nose and lips and a dimpled chin and everything. I kissed it every night. This book made me smile a proper smile today, which after the week I’ve had was really, really fabulous. Funny how that happens in the most unexpected of places.